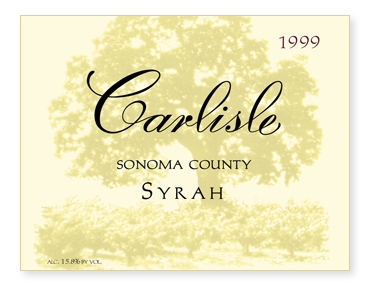 Many California producers seem to look to the Rhône as a model for producing Syrah. Having spent some time in Barossa and McLaren Vale of South Australia, my belief is that we share much more in common with "down-undah" than the Rhône. Generally, ripening fruit in California is not an issue. This, in fact, is one of our strengths. Hence, I've looked to Australia for techniques that play to this strength. While the fruit was sourced from young vineyards, the crop was held to approximately 2 tons an acre. The fruit was fully destemmed but crushed as little as possible. After a 4 day cold soak, the must was inoculated with L2226, an alcohol tolerant strain of yeast favored by top Australian Shiraz producers. At the peak of fermentation, around 5 brix, the wine was pressed into 60% new Allier oak with the remainder in 2-year old Allier and Tronçais barrels. The following year, the wine was racked twice via argon positive pressure and gravity fed back to barrel before being bottled unfined and unfiltered in April 2001.